A question that frequently comes up is "How do I get my module to connect to another database?" This question is not to be confused with "How do I run DotNetNuke using an alternate data provider such as Oracle or MySQL?" I find this question very odd because I think "Just connect to it the way you normally would". I now think I understand where the confusion comes from. After reading about the DotNetNuke DAL and DAL+, some developers begin to feel that there must be a DotNetNuke "official" way of connecting to another database. This is a great tool but it is designed to connect only to the database that DotNetNuke is running on. To connect to another database you have to write your own code. This can turn out to be a lot of code. If you have a development and production environment you can store the connection string in the web.config file. Note: there is a small risk in using this. There is no guarantee that it will always be included in future versions of DotNetNuke, but it has been there for the last three years. Even if we upgrade to the newest version of the Microsoft Application Blocks the new version still contains the SqlHelper class. 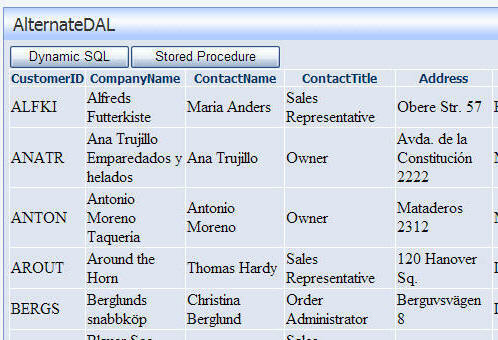 To demonstrate this I created a module (in VB and C#) that shows how to connect to the NorthWind database using Dynamic SQL and a Stored Procedure (there is a link to download the code at the end of this article).